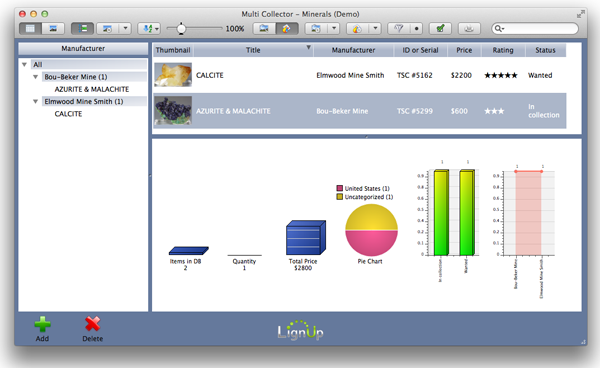 LignUp Multi Collector is a universal tool for managing many collections with any collectibles. It includes many functions like creating custom collection database; capturing images from web camera, get images online, correct images in graphic editor, edit various categories; password protection; report generation as PDF document and HTML site; smart filters and data sorting. Database manager allows to easily switching between different collections. Customers can change application style and customize view layouts by using thumbnail, statistic, item preview, category tree, table list widgets. Collections can be imported, exported and printed. Statement: First, please download the orginal installation package by clicking the download link. Of course you may also download it from the publisher's website. Using LignUp Multi Collector Free MacOS crack, key, patch, serial number, registration code, keygen is illegal. The download file hosted at publisher website. We do not provide any download link points to Rapidshare, Hotfile, Depositfiles, Mediafire, Filefactory, etc. or obtained from file sharing programs such as Limewire, Kazaa, Imesh, Ares, BearShare, BitTorrent, WinMX etc. Software piracy is theft. If you like LignUp Multi Collector Free MacOS please buy it.